Everything we were taught in Sunday school is wrong. The bad guys take their orders from Heaven, the good guys are trapped somewhere further south, and the guy with the flaming skull for a head is actually the property of God almighty. Naturally, these recent revelations have left Johnny Blaze, current bearer of the Ghost Rider mantle, a little confused. Well, maybe confused isn't the right word for it. Angry? Hungry for answers and racing for revenge? Either way, Blaze is sincerely ticked off and anxious to share a piece of his mind with the big dude upstairs. Only problem is, he doesn't know where to begin. This month, fresh off a visit to the nearby hospital, the Rider makes his way to a maximum-security prison deep in heart of the Lone Star State. And naturally, just like the infirmary before it, the jail is positively overflowing with angels, demons and religious fanatics. 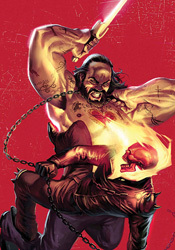 Writer Jason Aaron doesn't shortchange his readers on characters, that's for sure – the prison is bursting at the seams with tattooed miscreants, each one all too willing to share his own lengthy religious-themed backstory. But don't mistake that for depth. Despite their wordy elaborations, not one of the prisoners really clicks, stands out from the pack or establishes themselves as anything more than a bag of hot air. The first dozen pages in particular are excruciatingly slow to read, weighted down with far too much dialog for their own good. Aaron wastes our time with the life stories of characters who don't even make it out of the scene alive, let alone the issue, which makes the whole mess even more unforgivable. Why spend three pages of incessant character development if your plan is to just throw it all out the window, Deep Blue Sea style, at the first sign of trouble? Tan Eng Huat's artwork in this issue doesn't lack in style, although that doesn't mean it's particularly successful, either. His characters are rounded and exaggerated to a fault, too complex and detailed for their own good. His style is so busy, I often had trouble navigating a character-heavy panel or fight scene, and while he delivers on a few noteworthy splash pages, for the most part he brings more than any self-respecting page can handle. His work is like a blend of Angel Medina and Greg Capullo's individual runs on Spawn, so caught up in delivering something different that it loses touch with its readers. In a few specific moments, Huat gives us something truly remarkable, but to find them you'll have to wade through a lot of busy, over-exaggerated crap. He's an improvement over the stale, faceless artwork that's personified the series up until this point, especially in those infrequent shining moments, but that isn't saying much. This is a lot of setup and no payoff. It's disjointed, awkward pacing matched with uncertain storytelling and questionable characterization. Ghost Rider uses a handful of powers I didn't think he actually had, and when they don't have an effect on his enemy, I'm left to wonder why we saw them in the first place. The artwork is infrequently glorious, but typically overdone and difficult to follow. When the stars align and the two pages of good writing match up with the three solid artistic moments, Ghost Rider is surprisingly good. It's the rest of the issue that concerns me. Skip it.